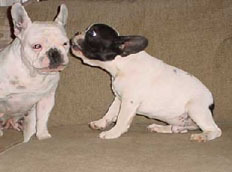 We are avid English Bulldog & French Bulldog lovers where the puppies are raised in our home with our family. We try to provide what we would buy for our own pets with each and every puppy having been introduced to life the way we would teach our children. The puppies are taught to love and receive love. Our puppies learn to interact with many other animals while they are with us. We feel one of the most important ways to insure a happy healthy dog is to provide them with as much nurturing as possible while they are with us. Thus, offering continued support in their new homes. We like to stay in touch with the families and see pictures as the babies grow. I am proud of each and everyone. More than anything I love to be able to share the joy with others that I have encountered over the years with every bully I have had. The joy and laughter this wonderful breed is capable of bringing to your home is overwhelming. There just aren't enough words to describe. I urge you to read my gallery of heart-felt testimonials of actual bully owners. 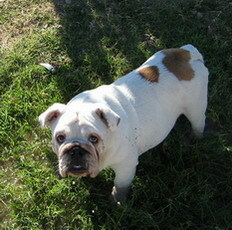 You too will soon have a better understanding of the greatness and dignity of the bulldog. We recommend the pet products from Nuvet!